In a market of Android phones, bringing something unique to the table is essential for the device to sell. The unique feature that LG Android devices bring is the set of shortcut on the rear side of the phones. While the LG G5, LG G4, and older flagships allow you to launch the camera and QuickMemo+ app right from the lock screen, wouldn’t you prefer to launch custom app with shortcut key on LG devices? With the help of a simple app, you can bring a whole of extra functionality with shortcut keys. 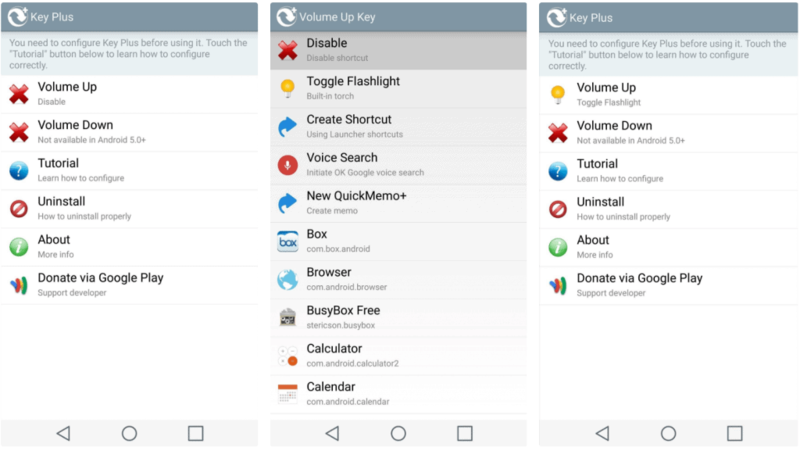 As the name of the app itself highlights, the Key Plus app is compatible with the LG G5, G4, G3 and V10. The app does not require any special root access to function and can be downloaded directly using the link given down below. One bad news for LG devices running Android 5.0 Lollipop and older is that you cannot reconfigure the Volume Down button. However, you can still change the mapping for the Volume Up button and associate it as a shortcut to launch any installed app. Moreover, you can also choose to disable the shortcut button if you find it be more annoying than helpful. Once you have selected the correct shortcut keys on LG devices, feel free to exit the app and continue. Once you have the shortcut key configured, go ahead and give it a shot and it should work just fine. Do share your thoughts on your favorite shortcut to use with the LG devices in the comments section down below.